"Today is a very great day for all the Sahaja Yogis because you could feel the existence of God. By saying there is God, that was not sufficient. And to say there is no God also was wrong, very wrong, and people have suffered, who have said like this. Only after they taking realization you know that there is God and there are vibrations. It is a very big opening all over the world. Today I am saying that's why it's one of the greatest days for you. Many of you have felt the cool breeze on your hands and out of your brain. Some have grown in Sahaja Yoga, some have not. Some are still carrying on with old catches. But now I have to say that quite a lot of you can become gurus, means teachers, and should you act as teachers. To act as teacher you should know Sahaja Yoga, the theory and the practice of it, thoroughly well. And then you can become great guru. It is a very big responsibility, lot of understanding for a guru. You should not have any ego first. You should not have any of your chakras catching. You should be absolutely clear all the time. And then the vibrations should be flowing in both hands. If they are moving in one hand and not in another, you cannot become guru. So you have to be a perfect Sahaja Yogi, then only you can be a guru. And so many of you can be, but you have to attain first, `Are you capable of being a guru or not?' With humbleness you will understand. Those who think they can be guru should become gurus, because now I can't travel from places to places. And you have to do my job, is to give realization to people. But you have to be able to give en-mass realization, then only you could be a guru. If you can give en-mass realization, then you could be a guru. You can use my photograph, but the realization should not be from the photograph, but from you. Then only you can be a guru. There can be ladies or men, both, can become gurus and spread Sahaja Yoga all over. Then my whole touring business, Canada I have missed, and I would request some of you to go to Canada, because it is a very beautiful place, and there are many beautiful Sahaja Yogis there. You have to do now my work. I won't be able to go all over, but you have to go to other countries, and create new Sahaja Yogis. You can do it. To begin with you can use my photograph, but latter on, you can only put the photograph there but use your own powers and give realization. You can do it, and that is how we can spread Sahaja Yoga all over the world. I have done my level best now, but I don't think now I can travel anymore. So I am telling you that you have to take over, and work it out. That doesn't mean you cancel Me – no, not at all! I am there with you. And every place you work you put my photograph. But realization you have to give and try to give mass realization. If that doesn't work out then you should know that you are not a guru. If you can give mass realization, then only you are a guru. Otherwise you are not. I said you can use my photograph, but you have to give realization to people. This is a sign of a guru. Then you will really know what are different centers, and what are the things missing in people. I have explained very clearly. In the same way you will find those who come for realization, they have some defects and you will find out what chakras they are catching. You know how to clear those chakras. So you will tell them how to clear. Now you have mastered Sahaja Yoga, so you should know what tricks to be done. If you think you have mastered, if you believe that you have mastered, then you can become guru. But first of all you should ascertain and find out for yourself if you are a guru or not. It is your responsibility now to give realizations to people. And you can give if you have vibrations, as like a guru. Or ladies also, they are called as guruis, not as gurus but as guruis. But they can be called as guru also. And they can also do this work very well. Solving the problems of people is not difficult then. Once they get realization their problems will be solved. This is a big power you have got. You all should use. First of all you can use a group if you want, and afterward you should do it individually. Can you imagine all of you, if you become gurus, how many Sahaja Yogis we will have all over the world? Whatever you teach, you must practice. The person who drinks cannot become a guru. A person who flirts and has a licentious life cannot become a guru. So first examine yourself, `Are you clean or not?' If there are any possessed people who try to become guru, they cannot. Honestly you should see on the photograph if you are possessed, then you cannot be guru. So now to become a guru is first to criticize yourself, to find out yourself only, and then you can become a guru. I don't want to tell anybody individually. But you all can find out. Say 4-5 people can join together, and they can find out from each other if they are all right or not, if there is missing, if they are catching. But if they say that you are all right then you can become gurus, and you can teach Sahaja Yoga. This is your own responsibility. This is how Sahaja Yoga will grow. 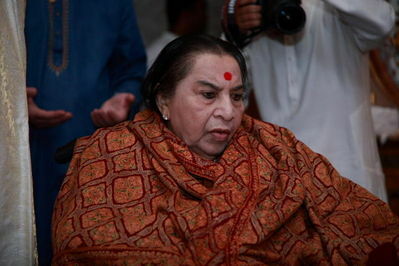 Otherwise after I retire or I don't go anywhere then Sahaja Yoga will go into waste. So it is for you to carry the torch, the light. It is your responsibility now. You have got your realization. I was born with the responsibility. I was born with all the understanding, and now you are also understand yourself. Do not condemn yourself as long as you start your own realization. But be careful. Don't become egoistical. You have to be very humble, very humble with everyone. And work it out because if they are not realized souls, you shouldn't condemn them, but tell them very patiently and sweetly that you are not all right. Tell them how to meditate, how to improve. It is now a very big responsibility. Actually I have done this work and you can do this work also. So you all have to become a guru. This is the day of guru purnima, and I bless you that you all can become gurus. Whatever you have got now, don't waste it, don't throw away, but use it for the betterment of people. If you want a meeting, add 4-5 people together. Then you should separate. You have to give time to this. You have got your realization, but you have to give realization. Otherwise your state is not all right, it is not normal. So today I want to tell you, what are the qualities we needed for a guru. First of all he should be a detached person. That doesn't mean you give up your family or anything. But you should have a detached attitude that anybody from your family does wrong, you should go away from them, sort it out. Secondly, through your realization you can see that you can spread happiness, and remove their problems. You have seen whatever I have done you can do it. You have got power to do it. But no hypocrisy. No hypocrisy, otherwise you will spoil the name of Sahaja Yoga. So if you are sure about yourself, then really you should become guru, and carry the work of Sahaja Yoga. I think I gave you all my blessings, and all my support that now you take over and become guru. You can also have all the pujas, and then you can use photograph. You have seen how one has to work it out. And somebody has  sickness or some chakras are catching, then you should tell that person how to correct it. On the photograph it is the best, and very humbly you should tell them what is to be done. And you can say [- ]. So now I am no more [ - ] businesses, I have done my best, and I think I won't be able to do this again. It is not my old age, but I want to give you a complete freedom to spread Sahaja Yoga. You have got it free, and you also have to give it to people free, not to charge them. Or in the pujas they take your name, be careful that don't put yourself on the puja till you are confirmed and you are sure that you have created at least hundred Sahaja Yogis, good Sahaja Yogis. Then they can do your puja also. But the best thing is to wait and see. You don't get into puja business till you are, you have done a thousand people each; then you have the right to have a puja. But you could have a puja with my photograph till you completely all right. Now how confident is the main thing. Do not condemn yourself. You are all realized souls, but those who can think they can become guru, can become and try. You have to have patience with the seekers. You can't be angry or hot tempered. Unless until they try to trouble you, you shouldn't lose yourself, temper. You should be quiet. Most of the gurus are very hot-tempered but I have seen before. And that is why they were very busy with their temper, and they couldn't [ - ] realization. So I have to warn you, control your temper. Watch yourself if you get angry, then you cannot become a guru. You have to be a loving person, very loving and understanding. Then you have to be humble, not abuse people, not to shout at people. If they misbehave you can ask them to go out. But don't shout. If you think somebody is misbehaving, you can ask that person to get out. But you need not shout and get angry with that person. So it is a very big responsibility now. You have got your realization. And so four of you or five of you join to form a Sahaja Yoga group giving realization to people. [ - ] of course my photograph will be there. But still you must try, try to understand that now what is your responsibility. If the position is given, you have to always carry on for the responsibility of that position. In the same way if you become a guru, you have a certain amount of responsibility, that your own behaviour should be very good to begin with. In the beginning you cannot tell them don't go to church, or don't do this, don't do that. You give them realization and then you can talk to them. In the beginning you shouldn't tell them, or they will just shun you. Accept them as they are. In the beginning you should not ask for pure people if possible. You can use my photograph to begin with but don't cure them. They can all, if you are confident, then four five together should treat that person. Curing people is not very easy and you may catch. So before acting on anyone you must take a bhandhan. Bhandhan is very good you should, even when you are going out if you take a bhandhan. You should also make a very good speech, if possible. Now you know so many things and you can talk to them. It is a very big responsibility. Now I have been working from the year 1970. And today so many years I have worked so hard, but I can't now do it, I have to go back and take some rest, help; everybody has said. And you are all scientists. But you can tell about me, if it is necessary. But use my photograph. Every time you have a meeting use my photograph. Those who think they can be leaders, and as gurus, they should first see their own vibration. Meditate on my photograph and find out. You have to absolutely honest that you are one hundred percent all right and there is no catch, and then you can become a guru. You have to do it. First you may get two people, then three people. I started with five. You can imagine how one can go. Try first of all two, three, five and more. You can also advertise afterward, if you have given realization to people, say about, say I have given realization to ten people you can start your own organization, or whatever you may call it, and can work it out. Now you have the power, you have the right, but you must have temperament also. In the beginning you have to be very patient and kind, very kind. Then gradually you will find that you can cure people. You can use my photograph for curing to begin with, and later on you can see you can cure. First of all on vibrations you face what chakras are catching, which are good and which are bad. And then you should correct them. If there is something wrong you must correct it and then become guru. It is not just accepting that I am going to become guru. But you have to be very, very authority on yourself. You have to judge yourself. First of all you should find out, `Can you become guru?' And then you can tell me your reports. I'd be very happy to know how many you have got now. And that is how Sahaja Yoga will spread, no doubt. It is fixed, it cannot remain as this state because I am withdrawing, but because now you are now so many Sahaja Yogis, which will grow and work out. But I think now I can't travel, and I am going back. I won't be able to come back again, not possible. So you better work it out for yourself. You must write to me if you have any difficulties, if someone is catching or something or if you have problems. Now I don't think any newspaper will criticize you. They have something for me, but not for you. All of you promise me that you will try to become gurus. I didn't take any money from you, nothing from you. I just want that you should spread Sahaja Yoga. In the beginning you are in the pujas, but don't take any presents or money. You can only take a little money from them if you have need to have a hall, or a big place. But that will be much later. First of all try with few people. It will grow very well. Now another thing is puja you should not allow them to do to you, to begin with, till you have done three hundred Sahaja Yogis, you can't ask them to do your puja. You can use my photograph for the puja to begin with. But be very careful, because you have powers now, and it might pamper your ego when you start thinking you are great. No, you have to save the world. All my work is that, and I would ask you to write to me in India if there is any difficulty. Also write to me how you are spreading Sahaja Yoga, what is happening I would like to know. But I think you may understand that I must retire now, I can't travel. If you have any questions ask me? Those who are confident that they can become gurus raise your hand? Oh so many --- only one hand not two. If anybody is making money, you should tell him not to do it. And also guide to him. You cannot take money to begin with, but when you have about three thousand people, you can celebrate all the worshipping days, and worship, But you must make at least three thousand disciples, then you can ask, ask for a puja. There are some people who cannot become gurus, who are catching, and they have problems. If you have problems don't become guru otherwise it will affect you, But if you think you are clear and opened out then you can become gurus. Is there any question? I am opening the center for International Sahaja Yoga, and when you have done with three hundred Sahaja Yogis, you can ask them to do puja and take money. Before that if you get any money you can send it to that center. There would be [ - ] in that center and I will declare it. If you have any questions ask me now. First three hundred people you don't take any money, except for the hall, or except for other expenses. But you don't take any money for yourself. Now can you raise up your hand how many who would like to be a guru?